# 1516. 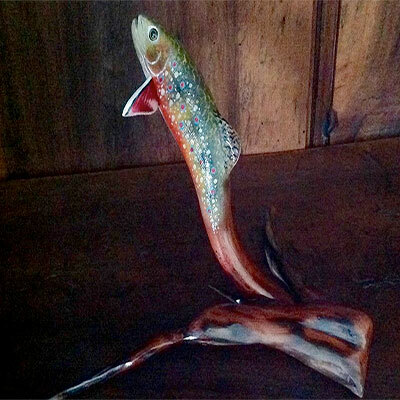 This 8 inch Brook Trout is created in the stylized form emerging from a piece of Tennessee Red Cedar root. I especially like the artistic lines of this one, it’s one of my favorites this year. It can be purchased in my wiley Trout store. A beauty, #1512 is as wonderful as it is wary; mounted on a gorgeous California Buckeye Burl. Make your casts quick. The bite will be gone before you know it..! This stylized Rainbow Trout #1512, is created from two pieces of very rare and hard to acquire, California Buckeye Burl. It is a beautiful wood and one of my personal favorites. The creek based Rainbow Trout is a highly prized fly-fishing subject. Wary. Skittish. And very leader-shy, they are hard to catch. This little beauty is representative of an demure little eight inch creek native found in the Eastern Tennessee creeks. Every WileyTrout Wood Sculpture is a unique one-of- kind piece. Each piece is signed and numbered. Wholely original pieces. As skittish and hard-to-catch as these little gems are, we work real hard to make it easy for you go home with one a WileyTrout beauty. This one can be caught in my Wiley Trout Store – #1512 Rainbow Trout. Hiding is what a brook trout does, when it’s not dazzeling the eyes out of anything watching it. But that’s the trick. You have to see it, first. With markings that blend in with a deft of camouflage that defies imagination, despite the bright colors, you just can’t see these critters unless they let you. #1535 is highly realistic representation of an 8 inch Brook Trout, presented as you would see it – and it equally amazing brethren – if you look into its underwater lair – stacked near the snaggy structure of the creek bottom pools; on piece of actual river driftwood just like you would see them hugging in their crystal clear world of invisibility. We don’t make it quite this difficult to see – or ever adopt for permanent residence – the little beauties. This wonder of nature is available for purchase at the equally amazing WileyTrout Store as – #1535 Realistice Brook Trout on driftwood. #1506 is a realistic 14 inch Rainbow Trout, focused on a fixed fly. Among the roots of the clearwater streams of northeaster Tennessee run the bright colors of the rainbow. Also known as Onchorinchis mykiss, the rainbow trout. This is not a native to the waters east of the Rocky Mountains, but its presence has been here long enough to have earned squatter’s rights and the love of generations of fly-fishing hominids. #1536 is a realistic Wiley Wood Sculpture of a 14 inch Rainbow Trout, caught in the act of warily glimpsing a snagged fly. The presentation has been placed and balanced on on a fine piece of river driftwood, from the very pool where you could expect to hook-up with this beauty. You CAN hook-up with this little WileyTrout gem by casting your gaze to the WileyTrout Store. Click the link here Rainbow #1536. Rocketing out of this beautiful piece of river driftwood #1507 is a stylized Brown Trout, created in the true #itsawiley tradition. I let the wood ‘talk to me’ and this is what it said, “Leaping brown trout in full rocket for a passing mayfly on the wing.” And that is what you get. Emerging out of the wood leaping for a meal that both you and the trout are forever locked into the possibility. This fine piece of Wiley Wood Sculpting is available for purchase in the WileyTrout Store – #1507 Brown Trout Stylized . Better nab this little critter soon before he leaps off the stage of available goodies and onto the shelf of a new, Master of its Imagination.